Stewart Mandel of SI.com is in Washington, D.C. today to cover the the Duke - Georgtown game. 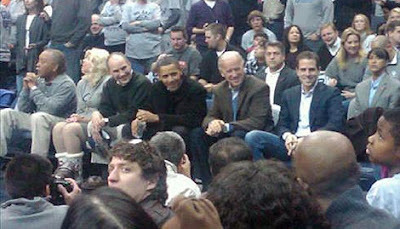 Instead, he got to cover a presidential pow-wow at the Verizon Center. Here is the photo he snapped of POTUS (i.e. Barack Obama) and Vice-POTUS (i.e. Joe Biden), followed by some of his tweets from the game. slmandel: Ladies and gentlemen, the VP has just joined us as well! slmandel: I've been informed of POTUS' location for the game. In the interest of national security, I won't tweet it. slmandel: I also just went through a TSA-like security check because, you know, the president's coming.